Experience a physician formulated 21 Day Detox program, clinically proven to help heal the body from depression, sluggishness, sleeplessness, fatigue, weight gain, infertility, acne and most chronic conditions. Have you ever wondered who and what’s behind the mass marketed nutritional supplements that you buy? Experience the difference with a physician formulated, quality supplement program manufactured by an FDA regulated facility, with strict pharmaceutical guidelines. 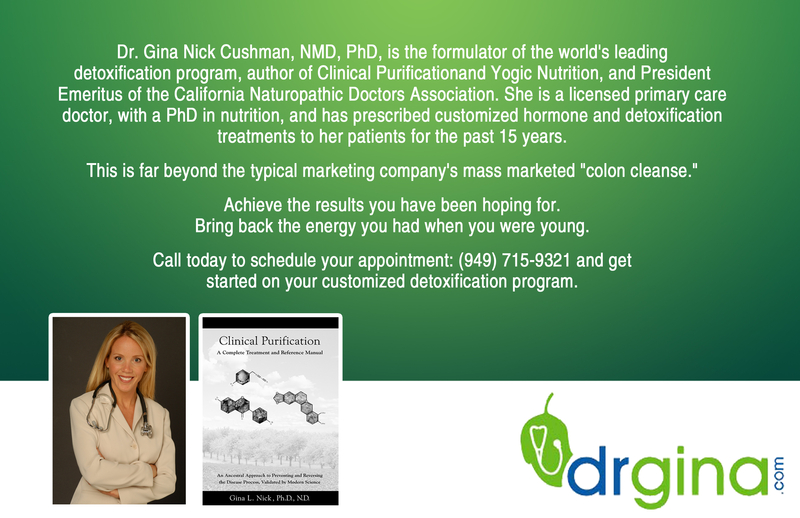 Dr. Gina is the creator of the world’s most popular detox/purification program for the last 12 years running. RSVP Required: 949-715-9321 or fill out form below. Limited space! Cost: $250 for the 21 Day Purification program. Optional 10 Day program available. You will leave the presentation ready to go, with your products and program! This entry was posted on Monday, February 10th, 2014 at 2:18 pm and is filed under Latest Nutritional Research, Toxins and Detoxification, Weight loss. You can follow any responses to this entry through the RSS 2.0 feed. You can leave a response, or trackback from your own site.